You might have noticed that Catholic translations of the Bible render Rom 3:25 differently than Protestant and Eastern Orthodox ones. So, when Catholics say that Jesus Christ is the expiation of our sins, it speaks the truth that Christ paid the full penalty on our behalf. 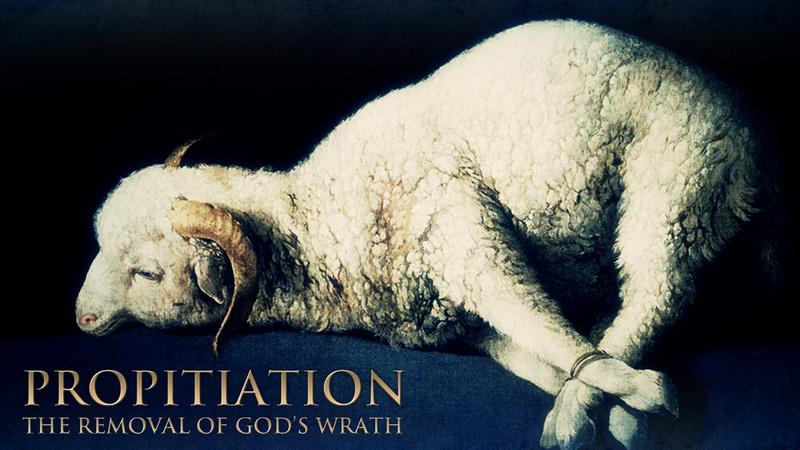 In short, propitiation means that there is a satisfaction of God’s justice or wrath. Catholics assert that God holds no “hostility” towards those who have sinned against Him. However, several references to God “inflicting wrath” (Rom 3:5) would appear to mitigate against this. The focus of expiation is upon the removal of obstacles to the relationship[ with God]. The focus of propitiation is slightly different: upon the welcoming attitude of the Holy One for whom these obstacles are removed (Eleventh Council of Toledo). Through the cross, God is brought near and conciliated, made propitious, or favorable to our hearing and plea. [Christ is] whom God displayed publicly as a propitiation/expiation in His blood through faith. This was to demonstrate His righteousness, because in the forbearance of God He passed over the sins previously committed; for the demonstration, I say, of His righteousness at the present time, so that He would be just and the justifier of the one who has faith in Jesus (Rom 3:25-26). Let’s ask a few questions? How did the expiation/propitiation occur? The shedding of Christ’s blood, without which there is no forgiveness of sins (Heb 9:22). How does someone attain the benefits of the expiation/propitiation? Why was the expiation/propitiation necessary? According to Rom 3:25 “to demonstrate His righteousness.” This alone would lend credibility towards propitiation over expiation simply because the demonstration of righteousness means that the offering of a sacrifice was necessary for there to be justice (which is the same word as “righteousness” in Greek.) So, the plain meaning of Rom 3:25 is that God’s sense of justice had to be satisfied, hence Christ’s blood appeased God’s sense of justice. This is propitiatory language. “Sins previously committed” before one has placed their faith in Christ are “passed over.” Expiation would require that these sins are simply forgotten or not accounted for. They are just “passed over,” right? Propitiation would require that the sins were passed over man and placed onto Christ. The latter idea is stated explicitly in the Scripture: “Christ redeemed us from the curse of the Law, having become a curse for us” (Gal 3:13). “He made Him who knew no sin to be sin on our behalf” (2 Cor 5:21). So, God did not simply pass over us, forgetting our sins because of Christ’s sacrifice. Instead, the Father specifically passed the curse that belongs to us, because of our sins, over to Christ and He bore our iniquities (Is 53:5). “His righteousness at the present time,” that is, the present time in which we are now faithful in Christ compared to the time we did not know Him. So, God’s righteousness is demonstrated meaning justice was satisfied. The Scripture just spoke of the idea that all fall short of the glory of God, so we may infer a payment for the penalty has occurred being that there is justice. Why did God want this demonstration? “[S]o that He would be just and the justifier of the one who has faith in Jesus.” Can expiation both demonstrate God’s justice and make Him the justifier of those who have faith? I honestly do not see how. However, if Christ’s sacrifice had a propitiatory effect it all makes sense. God is just because He punished sin, because it means that Christ bore God’s punishment and God was just in issuing the punishment. Expiation does not allow for this. Further, God is the justifier in that by being just in punishing sin, He has made unjust men just in His eyes. Hence, He is just in punishing and the justifier in making men just. This puts God both in the justice and justification business! In conclusion, it is our contention that propitiation is the clear and obvious choice. I would also say on a theological level that it’s a question of “both-and”. Christ both showed His Justice, removed the obstacles within man, removed the obstacles outside of man, removed the obstacle between God and man, and satisfied the Justice of the person of the Father (as in the classic Anselmian definition). Some prefer to think of the Atonement on one level or another, but the Scriptures and the Fathers talk of it by multiple analogies and angles. I attended a “Greek Fest” at the local Greek Orthodox church. A man from the church gave us a tour of the sanctuary and in his explaining, he said that Orthodox Christians don’t believe that Jesus paid a debt, or that he had to be punished for our sins/sake. I was flabbergasted. I mean, what’s all the exitement about Xristos Anesti if we aren’t celebrating that Jesus Christ paid the price for our sins, and we can be free? I’m quite perplexed. And, I’m quite confused and just can’t make sense of it all, including the (seemingly, to me, at least) fine distinction between the Catholic and Orthodox views of propitiation. So, I’ll have to re-read your good blog. Is there any simple way to ‘splain it to me? Appreciate it! That we may the more readily believe this mystery, the Word of God teaches us of it, so much as we may be able to receive, by the comparison of Jesus Christ with Adam. Adam is by nature the head of all mankind, which is one with him by natural descent from him. Jesus Christ, in whom the Godhead is united with manhood, graciously made himself the new almighty Head of men, whom he unites to himself through faith. Therefore as in Adam we had fallen under sin, the curse, and death, so we are delivered from sin, the curse, and death in Jesus Christ. His voluntary suffering and death on the cross for us, being of infinite value and merit, as the death of one sinless, God and man in one person, is both a perfect satisfaction to the justice of God, which had condemned us for sin to death, and a fund of infinite merit, which has obtained him the right, without prejudice to justice, to give us sinners pardon of our sins, and grace to have victory over sin and death. For if by one man’s offense death reigned by one, much more they which receive abundance of grace and of the gift of righteousness shall reign in life by one, Jesus Christ. Rom. v. 17. As a FYI the post you wrote back to is something I wrote as a Protestant (and I have since converted.) But that being said, the hymnography of the Church says that our sins are all nailed to the cross. So Christ paid a penalty…but He did more. He also conquered death and He gives us new life so that we also conquer death. So, he pays more than a debt, He also gives new life. Thank you, Craig! As a Protestant, I also believe that Jesus Christ paid the penalty and more — that he gives us new life, victory over sin, death, satan. I thank you for this affirmation of what I suspected. One more question: do Orthodox believe that a person must personally accept this victory/salvation for themselves in order for it be real in their lives? So faith is how we personally accept the reality of the resurrection, and the fruits of that faith (work) are how we live out that resurrection and take ownership over it. The most popular Orthodox Pascha (Easter) hymn is “Christ is risen from the dead, trampling down death by death, and upon those in the tombs bestowing life.” So His death conquers death by destroying it. He has put death to death. And He has given life by resurrecting, because this redeems the fallen human who was destined to die before our Pioneer has made it possible for humans to now live eternally–because He does! So He demolished death and the fruits of the victory over the grave in His resurrection is eternal life. Within Eastern Orthodoxy, from my experience after conversion a couple years ago, the EO almost without exception, reject Penal Substitutionary Atonement. A much more common understanding of the atonement is far more similar to Christus Victor. From your writing, it appears you are hearing something different from your priest?